A gray nose poked from the deep green grass. A cunning eye, attentive ears and a sleek, lean body burst from the left. The Jeep’s brake pads gripped the rotors firm, but not hard enough to squeal tires. A second wolf, a bit smaller than the first, appeared. Both looked straight at me as if questioning my intrusion into their territory. Neither animal hesitated or broke stride. 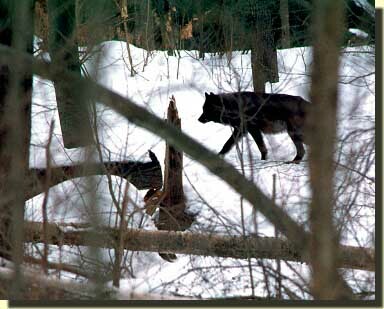 In a matter of heartbeats the wolves melted into the lush underbrush that hugged the right roadside. Wolf photo courtesy of Michigan Department of Natural Resources Photographer David Kenyon. We traveled a short distance before either of us said a word, other than “wolves.” Tami commented about how it was “3:30 in the afternoon on a bright and sunny day.” It was then we both thought about the Nikon sitting on the back seat. As married couples do, I answered her unspoken statement with a reassurance that the wolves came and went so fast neither of us could have gotten a picture. The chance meeting was destined to fall in the magnificent memory category for both of us. We were in route to the Michigan Outdoor Writers Association dedication ceremony for the Ernest Hemingway historical marker at the East Branch of the Fox River Forest Campground, located on M-77, eight miles north of Seney, in Michigan’s Upper Peninsula. 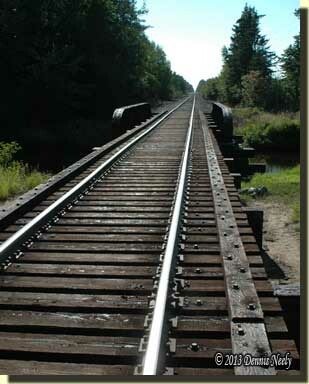 In 1919, Hemingway rode the train into Seney, then hiked to the Fox to camp and fish. His famous short story, “Big Two-Hearted River,” is based on that fishing trip. That afternoon turned out to be special. 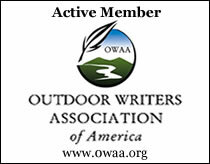 I wasn’t dressed in 18th-century garb or toting “Old Turkey Feathers,” but outdoor experiences are like that. On the one hand, we had a great time at the dedication—we saw new country, made new friends and reconnected with old ones. A few feet away, down over the cut bank, the Little Fox River gurgled on its way throughout the speeches and stories, just as it did before and will after. When the festivities ended, we all quietly, almost reverently, dispersed. I had reread “Big Two-Hearted River” the week before, so the historian in me wanted to see the Seney train station and walk the tracks a ways. I was hoping to experience the same kinship with Hemingway that I feel with my hunter heroes, and I did. If I had the time, I suppose I would like to try traditional fly fishing—I’m sure there are fishers out there who do that. On the other hand, the brief encounter with the wolves was also a first for Tami and I, the first time either of us have seen wolves in the wild. I’ve seen fresh wolf prints on a sandy two-track not far out of Escanaba, but never seen the real deal. That’s not surprising, because I spend the vast majority of my woodland hours on the North-Forty. I’m happy with that, and have been for all my live. A person grows to love a piece of ground, and one of the attractions of that love affair is the constant change and newness each excursion offers. The physical changes that mark a given piece of property happen gradually, and most hunters, traditional or modern, never give them much mind. Only when we catch ourselves telling stories of what the lay of the land was like “back in the 1950s, or 1960s, or 1970s” do we come to realize the land has evolved. Seeing the wolves was such revelation. One of my first mentors was Joseph Doddridge. Like so many traditional hunters, I read over his musings about the wolf but failed to assimilate it in my historical persona—wolves were not relevant to my 18th-century experience, in part, I think, because I lacked 20th- or 21st-century knowledge of wolves. And even Doddridge, looking back in 1824, spoke of wolves more from memory. And then there is Darius Cook’s narrative, appropriately titled Six Months Among Indians, Wolves and Wild Animals, in the Winter of 1839 and 1840. I passed over Cook’s writings based on the fact the time period did not correspond to my 1790-era persona. I have come to the opinion that sometimes the well-meaning emphasis on limiting one’s research to a specific time period, geographical location and station in life creates a vision pattern that distorts the overall perception of one’s persona. This joyous journey is endless. The path to yesteryear is littered with magnificent memories. And some, like the chance sighting of two wolves, turn one’s perceptions upside down, but the goal of this glorious endeavor is a better understanding of the truth. Hopefully, today’s knowledge is better than yesterday’s and tomorrow’s revelations will be better than today’s. And what a chance sighting it was! We may never see live wolves in the wild again. I was particularly happy to be safe within the confines of the Jeep, with you, dear. Why not? They are fairly common where I hunt in the Yoop, south of Escy.